Most people visiting Australia start in Sydney, and who can blame them for choosing this city as an ideal gateway to the country. Featuring a stunning harbour setting with the world-famous Opera house landmark, many diverse attractions and a cosmopolitan outdoor lifestyle, Sydney is an increasingly popular leisure destination. Sydney, the capital of New South Wales, is Australia's oldest and largest city with a population of around 4 million. Sydney's ever increasing popularity as a holiday destination is due to the amazing variety of leisure activities it has to offer, ideal climate, beautiful setting and welcoming atmosphere. 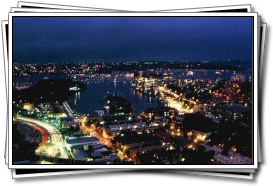 The city is built around a huge harbour and hosts many tourist attractions as well as a number of beaches, bays and a couple of national parks. Sydney was voted the "World's Best City" for the seven years of the last eight in the US 'Conde Nast Traveler', after being judged against other world cities according to their cultural enrichment, restaurants, ambience, energy and the friendliness of their people. 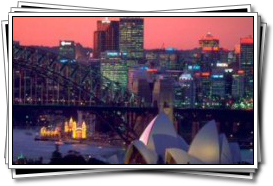 Another American magazine, Travel and Leisure rated Sydney the "World's Best Value Destination", having nominated it the "World's Best City" for three consecutive years from 1996 to 1998. But why take their word for it when you can find out for yourself? Choosing to embark on an Australian adventure? Browse these outdoor activities and experiences. 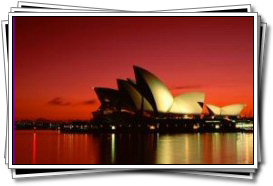 For a comprehensive list of Sydney attractions that are suitable for children click here. New South Wales is a large and beautiful state, with swathes of green countryside along the rivers and coast line and historic colonial towns to explore. There are many popular routes for driving holidays and a surprising diversity of areas to visit, from subtropical rain forests and palm studded coastlines in the north towards Queensland, secluded lakes and scenic spots, millions of acres of flat farmlands and to the far west, desert. The Snowy Mountains are popular for skiing in winter, and include Australia's highest mountain, Mt Koscuisko at 2228 metres above sea level. Despite being Australia's most densely populated region, once away from Sydney and its surrounding coastal regions New South Wales is surprisingly empty, open and peaceful. Sydney has 4 distinct seasons, each of which is enjoyable. Autumn is warm and crisp; winter averages 15°C in the daytime - although temperatures can drop below 10°C, which feels comparatively cold; spring can be wet but is generally pleasant. If you plan to spend a lot of time on the beach, then summer is the best time to visit - although it can be a little humid. Away from the coast, the alpine range of the Snowy Mountains experiences heavy snowfall from the end of June to early October, which makes for good skiing. Australia's most famous city is also a highly sought after location to live in. Recognized as a world financial centre, offering great employment opportunities, coastal lifestyle and boasting some of Australia's top schools, living in Sydney is a world away from what most foriegners would consider the Australian Experience to be. Sydney is urban, chic, leafy and by any standards, a bustling, modern city.